In the fall and winter, most native forages and tame pastures are low in protein (unless fall rains have stimulated new growth), yet many stockmen try to extend grazing as long as possible through winter because winter feeding is the most expensive part of raising cattle. Depending on the protein source, adding a protein supplement to mature, dry pastures is generally cheaper and just as effective as feeding supplemental hay. Adequate protein level in a ruminant diet is crucial for optimal growth and function of rumen microbes. These microbes are the key to digesting and unlocking the complex carbohydrates that are present in dried forage. The rate of fibre breakdown affects the rate of passage of ingested feed through the GI tract. If digestion/breakdown is slow, this limits the amount of feed an animal can eat on a daily basis. 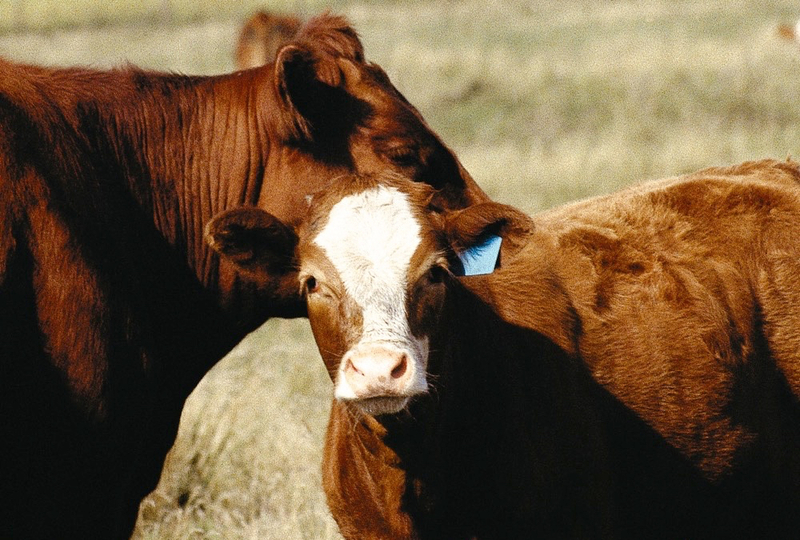 Low feed intake can cause cattle to lose body condition on dry fall pastures. 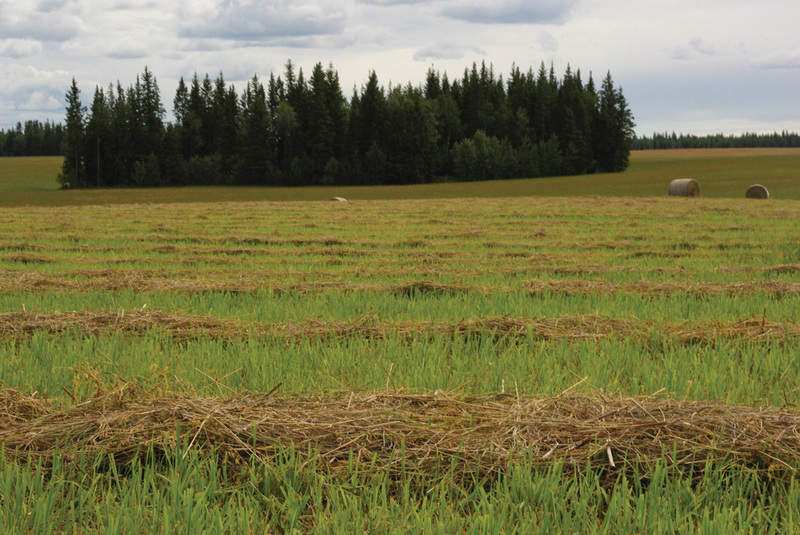 Mature perennial forages are typically high in fibre and low in protein, so the rumen cannot adequately digest the low-quality forages. The first thing that happens when a ruminant is short on protein is that feed intake goes down, according to Alberta beef and forage specialist Barry Yaremcio. “Cattle can’t eat enough forage to maintain themselves, so they lose weight. “With a protein supplement we are feeding the microbes. The microbes break down feed components into the basic parts — sugars and amino acids — and then the animals build everything back for what they need,” he explains. 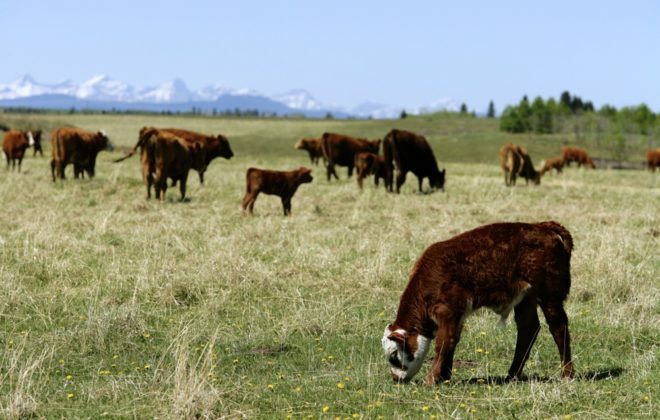 Cattle often lose body condition on dry fall pastures, at a time when they should be building reserves in preparation for winter and their next calving. Protein supplements can help improve digestion of low-quality forages. 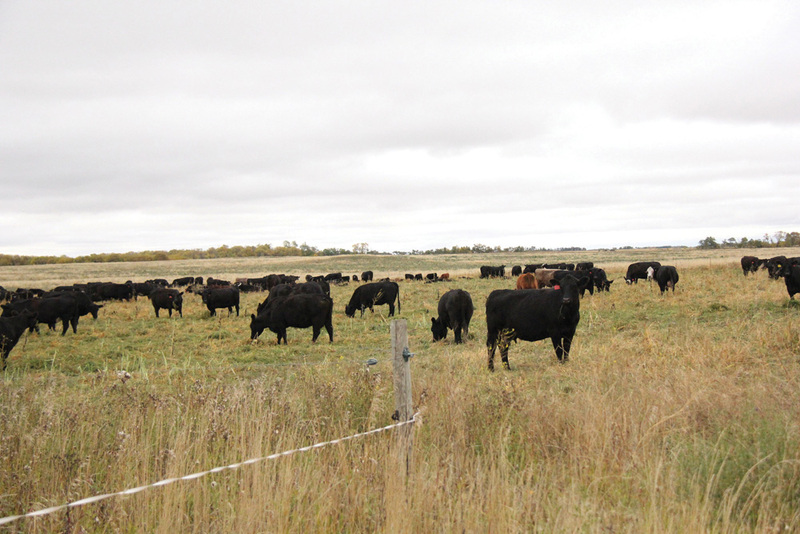 Fall/winter grazing may consist of stockpiled native pasture, tame grass pastures, crop residues, windrowed forage, or regrowth of stubble fields after fall rains. 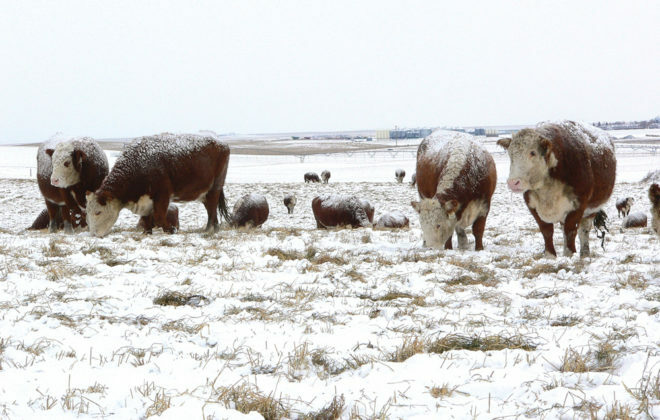 Some of these pastures and crop residues may have adequate protein at first and then those levels may drop as the season progresses into winter, and cattle will need a supplement. “Supplemental protein, whether supplied with alfalfa hay, protein pellets, blocks or tubs, or high-protein byproduct feeds like wheat or corn distillers grains, or home-grown feeds such as peas, lentils, fababeans or soybean screenings, can help improve digestion of low-quality forages and build body condition,” says Yaremcio. Tim McAllister from the Agriculture and Agri-Food Canada, Lethbridge Research and Development Centre says no matter what feed source you are using, you need to think about the nutrient requirements of the animal you are trying to feed — whether it’s a young growing animal, dry cow or lactating cow — because their requirements are dramatically different. “Energy and protein requirements for a young animal are very different from that of a mature, dry cow. 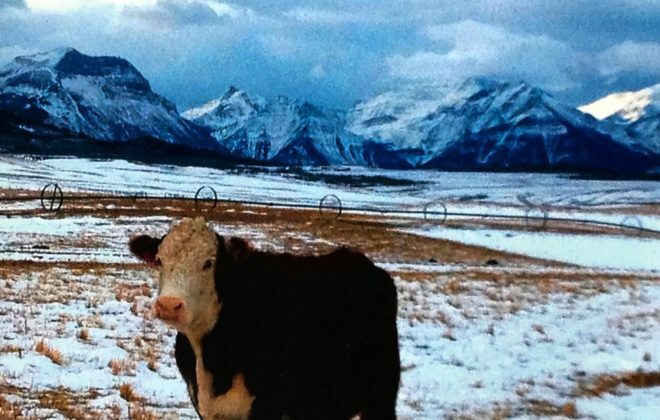 When talking about low-quality forages, such as the material we might be stockpiling for winter grazing, this has the lowest level of protein and the highest level of structural carbohydrates (that must be broken down before it can be useful to the animal),” he says. “Most of the protein in the plant is associated with photosynthesis — the capture of carbon dioxide from the air. That’s how plants build sugars and cell wall carbohydrates. Once the plant is mature and no longer photosynthesizing, and turns brown instead of green (devoid of chlorophyll, which is what makes the plant green), the protein is at very low level. 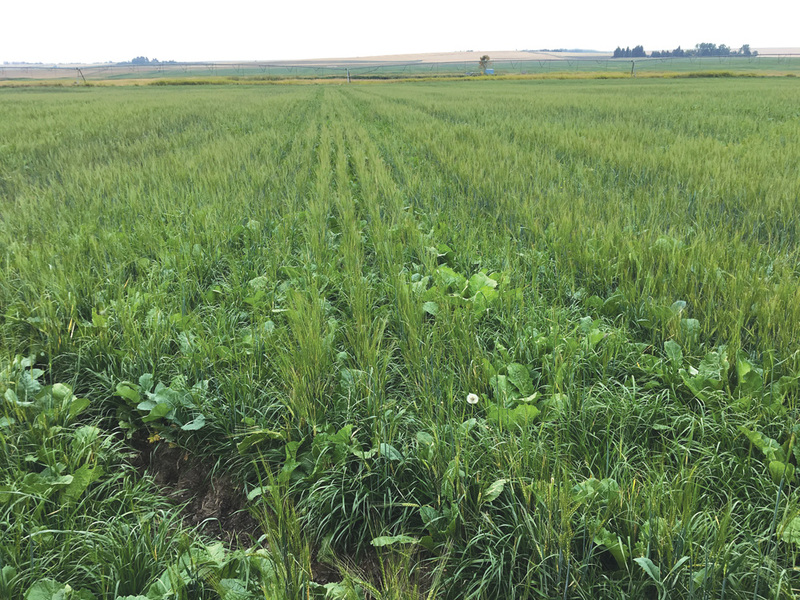 The plant has gone into a state of dormancy and is no longer actively growing or producing protein; it has stored nutrients in the roots and it is metabolically inactive,” says McAllister. “At that point the protein level is the lowest and the plant cell walls are the most mature, with the most lignin (which has the lowest digestibility). This is why the mature plant has lower feed value,” he explains. “The amount of protein required depends on the type of animals eating the forage. A mature, dry cow can probably get by on a diet that is only seven to nine per cent protein and do fine. The rumen microbes can still utilize the amino acids and protein within those plants, then use that nitrogen to break down the carbohydrate in the mature cell walls. The dry cow’s energy and protein requirements are not nearly as high as for a growing or lactating animal, and you can save money by not supplementing. For the young or lactating animal, however, you need more energy and protein, especially the protein to supply the microbes with what they need,” he says. If you provide more nitrogen (protein) you get more microbes, so better digestion as it goes through the digestive tract faster. The animal can then eat more, process more, and get more good from it. “In these situations supplements make sense. Try to identify the cheapest protein source you can supply to the animals with the conditions and facilities available on your farm or ranch so you can accomplish this. Many things affect this. Distillers grains are a very good protein source, but they are typically a mash or in pelleted form. You need to figure out how to feed it in pasture conditions without a lot of waste. If your only option is to feed it on the ground there will be significant waste,” he says. Sometimes decent quality mixed alfalfa/grass hay can be more easily fed, to provide the necessary protein, if you have some available. 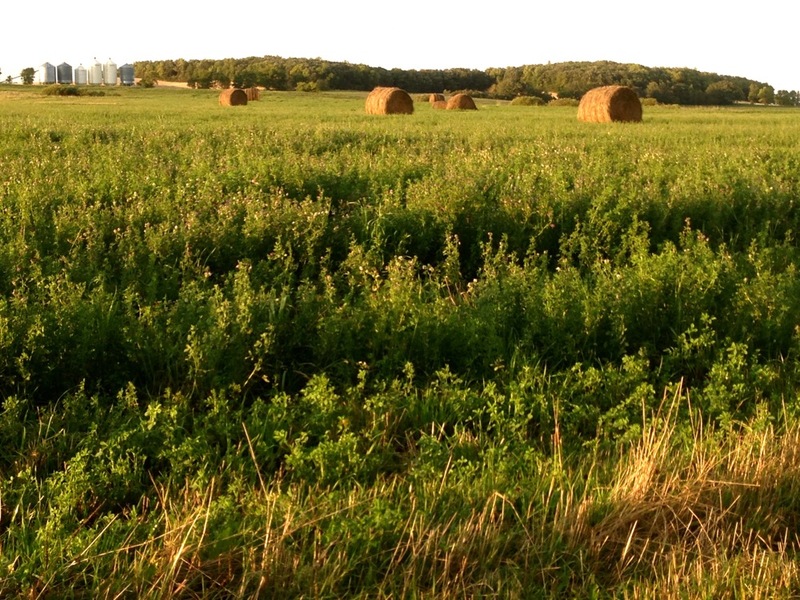 Alfalfa can be fed every other day or every third day, which can lower your cost. “You don’t want to overfeed protein, to the point where what we call substitution starts to take place. Protein can also be used as an energy source by the animals, but it’s a very expensive form of energy. 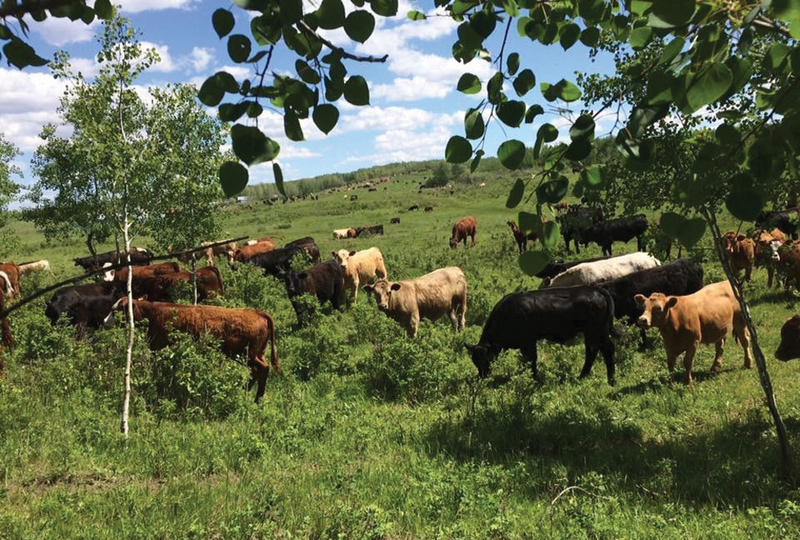 We don’t want the cattle to just be eating the supplement and not grazing the lower-quality forage that we stockpiled for them to utilize,” he says. Some of the greedier, more aggressive animals will eat more than their share of the protein unless they are limited in their consumption rate. “This is why we have to monitor, and use strategies like alternate day feeding, etc. The ruminant animal is extremely efficient in utilizing nitrogen, and can recycle some of the nitrogen consumed the previous day and utilize it the next day and recycle it back to the rumen, and the microbes can still utilize it,” he says. There are many kinds of supplements. “Basically you want the highest-quality protein for the least amount of money. Often byproduct feeds are a good choice (if available) such as lentil screenings. If you don’t have to transport them very far and have a way to feed them to minimize waste, these work very well,” he says. Use what is available and economical in your situation. “We always need to look at prices and availability,” says Yaremcio. “Continuity of supply is a consideration when planning a feeding program. Establish the amount of product that will be required and either lock in delivery dates or preferably take delivery of all the product that is required before it is needed. Digestive problems might be encountered if you have to switch products halfway through the feeding period because supply is interrupted,” he says. “Price out the cost of protein on a per-pound basis. For example, canola meal on September 12, 2018, was $295 per tonne. Canola meal contains 38 per cent protein. This provides 380 kg of protein per tonne, or $0.77 per kg of protein. Pea grain contains 24 per cent protein and was valued at $250 per tonne, a cost of $0.96 per kg of protein. The same calculation can be done for any product to compare the cost of protein supplied. This is more important than the cost of the feed. Alfalfa hay can be a good supplement but right now hay is very expensive in southern Alberta and local supplies are limited. Trucking hay from other locations becomes prohibitive because of freight costs. Calculate the cost of protein landed in the yard,” Yaremcio says. Other sources may be more economical. “Byproducts such as wheat distillers (40 per cent protein) and corn distillers (30 per cent protein) can be fed at two to three pounds of byproduct per feeding. Feeding events can be every few days rather than daily. There is research showing that feeding protein twice a week or five times in two weeks would be adequate,” he says. It all depends on the type of animal being fed, but reducing the number of feedings can save time and fuel. “We also need to look at impact on animal performance. The amount of supplement and number of feedings per week depends on whether we are feeding dry cows, lactating cows or young animals. Protein requirements will vary. Consult with a feed salesman, mill nutritionist, private consultant or provincial extension specialist to obtain suggestions on what is needed to meet animal needs,” says Yaremcio. Supplementation will be important this year in many places. Many producers are preg-checking early and going to market early with anything that’s open because they can’t afford to feed them. “It may be necessary to feed pregnant cows lower-quality forages or straw/grain rations and save the higher-quality hay and silage for after calving. Knowing the quality and quantity of feed available is key to developing a sound winter feeding program. Feed testing is the first step. Use a program such as CowBytes to develop rations at home, or get help. When looking at the ration programs, pay attention to the macro minerals especially the calcium-phosphorus ratio, magnesium levels, vitamins and trace minerals. Match purchases to needs and if necessary have a custom product manufactured. Feeding a product that is convenient to use may not meet requirements. Evaluate what the fortification levels from the product tag to see if the product will work before making a purchase,” he says. Yaremcio says the key objectives of late-season pasture supplementation are to keep feed intakes high to maintain cow condition. 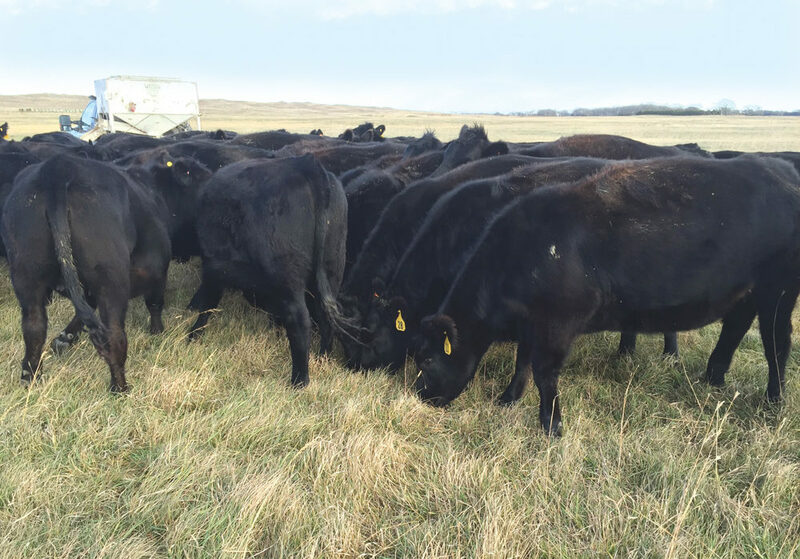 If calves are at side, keep them growing at acceptable rates; utilize lower-quality forages that are still available on pastures late in the year. The minimum protein content to maintain rumen function is seven per cent on a dry matter basis to keep microbial populations high which allows efficient breakdown of the fibre components in the grass or forage. “Some of the microbes have a life span of only 20 minutes. If populations are low, fibre digestion rates are slower and feed intake may be reduced,” says Yaremcio.